Slate-ish is a unique tile with the look of real slate, but is made from recycled and reclaimed materials in the USA. Slate-ish is a paper composite that is lightweight, durable, and easy to install. This tile can be used in many applications where real stone would not make sense - either from a durability or ease of installation standpoint. There is no other product on the market quite like Slate-ish! What is Slate-ish made of? Slate-ish is made from paper-laminate composite materials. These solid core laminates are made from layers of paper and resin, which is heated and pressed. These materials are normally used for countertop applications in residential and commercial projects, and anything from skate board ramps to bathroom partitions. 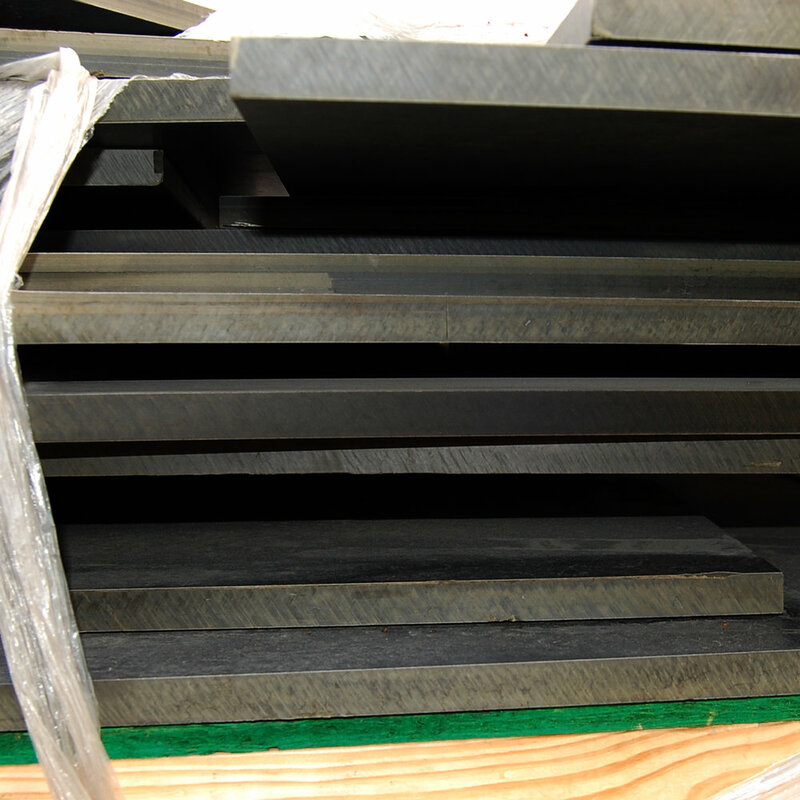 We source scrap material from fabricators to make Slate-ish. The sink cutouts, awkward shapes, or pieces that are too small to be used in normal applications become useful as our raw material. A note on the"back" of Slate-ish tile: Because we take in reclaimed material that comes in cut-up sheets, there is sometimes a surface to Slate-ish that is the former "face" of the reclaimed sheets! This former "face" becomes the BACK of our tile! This can be any color, patterned, or even wood grain print, and is smooth to the touch. It does not affect the look or performance of the tile, and is mean to be hidden. Slate-ish is hand made in Lincoln Nebraska. How do I order Slate-ish? You can order directly from this website! We offer 10 and 20 SF Cases of Loose Tiles or 20 SF Cases of Mounted Panels. All prices listed are per square foot or per case, in US dollars. There are 10.764 square feet per square meter. Have a question on the product, installation, or lead time? Just drop us a line. Do you offer discounts to designers and professionals? Please contact us for pricing discounts through our Trade Page. Because our product is made from reclaimed material, our color selection is dictated by our raw material sources. Click this link for an explanation of each color: Color Chart. Our Color Blends start as a Standard Color Base, and we've developed a method to hand apply natural mineral pigments with a water-based carrier to closely mimic natural stone colors. This multi-step process allows us wider application possibilities! It's hard to get a good idea on a computer screen - be sure to order our Samples to get an accurate idea of color. We offer 1.5" Strips in random lengths. Custom sized / shaped tiles are available- contact us for a quote. Can I order custom shapes and sizes? Sure you can! Please contact us with your idea and we will develop a quote for you. Click on our Special Order page to contact us. Can I get this mounted on a larger panel instead of loose tiles? Custom mounted panels are available by special order. Please contact us with details - we would be happy to discuss the pros and cons of this method for your particular installation. In Commercial installations, there are some instances where a panel installation may be ideal - in large areas, or where the speed of installation is important. We can custom size mounted panels up to 4' x 4' (for ease of handling and shipping) on a wood substrate appropriate for the size and application. Contact us to discuss your project and we can determine together if a mounted panel is right for you. Shipping charges may be additional for freight shipping. Where can Slate-ish be installed? Slate-ish can be installed on nearly any flat interior surface. Possible uses include: Feature walls, fireplace surrounds, backsplashes, ceilings, wainscoting, headboards, home theaters, cabinets, doors and any place you might use paint or wallpaper. See our Installation Recommendations for appropriate substrates and adhesives. This tile is moisture-impervious, impact resistant, and lightweight. Can I use Slate-ish around a fireplace? Yes! Slate-ish has been used for many fireplace surrounds over the past 10 years. We mostly see this used in conjunction with “insert” style fireplaces. This tile should not be used where it will be in direct contact with flame. See our Gallery for images. How many square foot should I order? Because these tiles can be cut to fit your space, you should not need to order much more than the actual square feet needed for your project. Our Strips style normally has the least waste – but this will depend on the details of your installation. If in doubt – contact us and we can help you decide how much to order. Earth, Chalk, Asphalt and Soot will usually ship within 1-2 business days. Rustic and Limestone ship in 1-2 weeks. Orders are shipped FedEx Ground (3-10 day transit). All orders can be expedited for an additional fee. Please contact us for an accurate quote! What kind of installation tools do I need? Wood cutting tools (miter saw, jig saw, or even a hand-saw if you really want a workout! ), adhesive (clear silicone caulking or fast-grab adhesive), utility knife, level, marking pencil, tape. Installation is very simple – see our Installation Recommendations for details. What adhesive do you recommend? Do I need to seal the tiles after they are installed? Sealing is not necessary or recommended - however it is important to point out that if you DO choose to seal your tiles, they will darken in color significantly. You can test this color difference on unsealed tiles by simply wetting the surface. You can seal these tiles with water based polyurethane, Bioshield Herbal Oil, or a number of other treatments. The tile itself is non-porous. This sealer treatment is purely aesthetic. How this treatment is applied and what you use will affect the look of the tile. Many sealers can be used - though we like the oil finishes - if applied sparingly they give a nice matte finish that leaves the Slate-ish looking more natural. Unsure about the sealer you have chosen? Just do a test piece and see if you like the results! Do I need to grout Slate-ish after it is installed? No - in fact, most installations are done in a "dry stack" method - leaving no space between the tiles for grout. However, you can install Slate-ish with a space, and grout like any standard ceramic tile. See our Installation Recommendations for more information. What is the care and maintenance for Slate-ish? A dry paintbrush or a vacuum with a brush attachment will allow you to dust the nooks and crannies of Slate-ish. A dry or damp cotton cloth can also be effective. Oily spots and other surface marks caused by natural skin oils, grease, even permanent marker and most paints, can be removed with acetone. NOTE: We do not recommend using acetone or other solvents on our new Color Blend material, as it may affect the finish color treatment. In the Continental US, all orders, including samples, are shipped FedEx to ensure their delivery. Orders outside this area may be shipped with USPS, UPS, or other shippers depending on the best rate! How do I know how much shipping will be? Add items to the Cart, then go to checkout. Enter your email address, which will open up the shipping address portion of checkout. If you enter your zip code, it will update to show the shipping cost via FedEx. Samples ship via Fedex Super Saver, and all Case products ship FedEx Ground. We can ship outside the US! Shipping outside the US can add up to $5/sf depending on your location. Samples can be $25-50 for shipping. We find the best rate we can through various means. If you are outside the US, you can contact us for a shipping quote - we’re happy to see if we can get you a better rate than might show on our online calculator. Email: jen@slate-ish.com with your address and what you are trying to order. If you know how many square meters you need, take that number and multiply by 10.764 to get the correct number of square feet. Please feel free to contact us if you want confirmation that you are ordering the correct amount. You may also provide your DHL or FedEx account numbers to cover shipping costs. Note that orders shipped overseas do not include VAT or any other duties or taxes - this will either be due at the time of delivery, or will be billed to you by the freight company. Didn't find the answer you were looking for? Don't worry - go to the Contact Page and let us know what you need.